Illinois Drivers license, teen driving permits, Teen drivers education classes, drivers ed, defensive driving classes, traffic school, traffic safety. Drivers education classes for teens and adults. 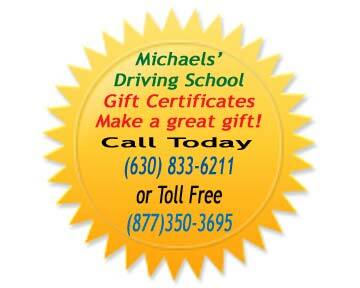 Michaels Driving School serves the Suburban Chicago Illinois area, including Dupage County Kane County, McHenry County, Cook County and Lake County. 8:00 a.m - 7:30 p.m.